Keeping in mind that God is not a Republican or Democrat, we must involve ourselves in politics in ways that would reflect our understanding of God’s Word. All candidates should be examined by measuring their policies against a complete range of Christian ethics and values. These measures of a candidate’s suitability for government office should include: do their policies enhance human life, human dignity, and human rights; do they strengthen family life and protect children; do they promote racial reconciliation and support gender equality; do these policies serve peace and social justice (we will discuss this term in future weeks); do they advance the common good rather than only individual, national, and special interests? As voters we can not be single-issue voters. What are some of the religious issues we must consider in deciding who we will support and vote for? 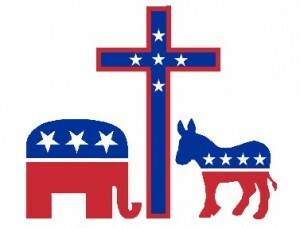 Do any of the parties or candidates try the exploitation of religion or the congregations for partisan political purposes? Christians are called to more thoughtful involvement in an election, rather than claiming God’s endorsement of any candidate. Because of an almost uniform media misperception, many people around the world now think Christian faith stands for political commitments that are almost the opposite of its true meaning. How did the faith of Jesus come to be known as pro-rich, pro-war, and only pro-American? How do we get back to a historic, Biblical, and genuinely evangelical faith rescued from its contemporary distortions? That rescue operation is even more crucial today, in the face of a deepening social crisis that cries out for more prophetic religion. Of course, nobody can steal your personal faith; that’s between you and God. The problem is in the political arena, where strident voices claim to represent Christians when they clearly don’t speak for most of us. We saw that just recently when Nancy Pelosi, Chelsea Clinton, and Elizabeth Warren used ‘their belief in God’ to justify abortion. It’s time to take back our faith in the public square, especially in a time when a more authentic social witness is desperately needed. The religious and political Right gets the public meaning of religion mostly wrong, preferring to focus only on sexual and cultural issues while ignoring the weightier matters of justice. The secular Left doesn’t seem to get the meaning and promise of faith for politics at all, mistakenly dismissing spirituality as irrelevant to social change. I am a conservative on issues of personal responsibility, the sacredness of human life, the reality of evil in our world, and the critical importance of individual character, parenting, and strong family values. The popular presentations of religion today, especially in the media, almost completely ignore the Biblical version of social justice and dismiss such concerns as being ‘left wing’. It’s time we take back our faith…but from whom? We will look at that next week.